I used 2 pounds sirloin, sliced into short strips, because it’s what I had on hand. This is an excellent recipe. Abounding in flavor, but so easy to throw together. Cut meat into one-inch cubes. Place whole-wheat flour, salt, ground pepper, oregano and basil in a large plastic container with a tight-fitting lid. Shake the contents so they mix. Now place the cubed meat in the container and shake until coated. Meanwhile in a large Dutch oven heat the oil and saute the garlic and onions until soft. Add remaining vegetables. 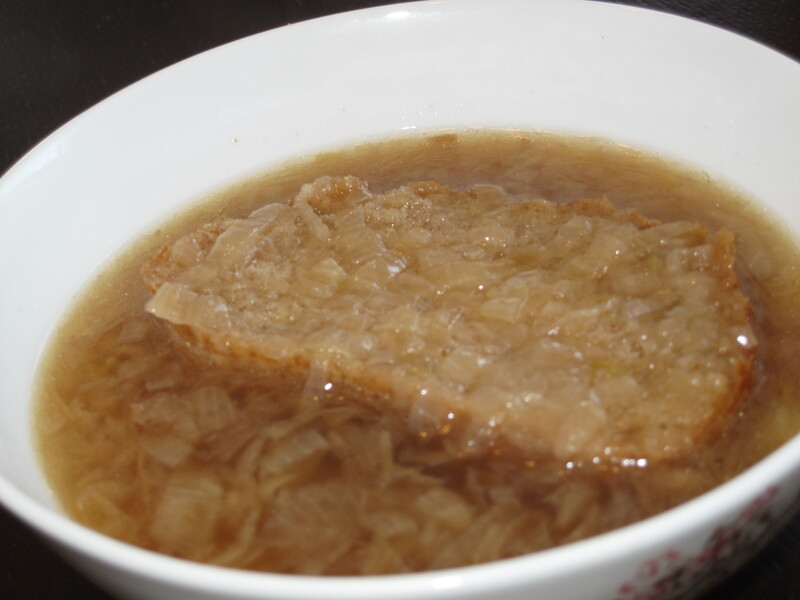 Cook until meat is browned. You will notice the mixture is getting sticky. This is caused by the flour seasoning on the meat. When it gets too sticky add the chicken stock and light beer. Bring to a boil and then reduce heat to a simmer. 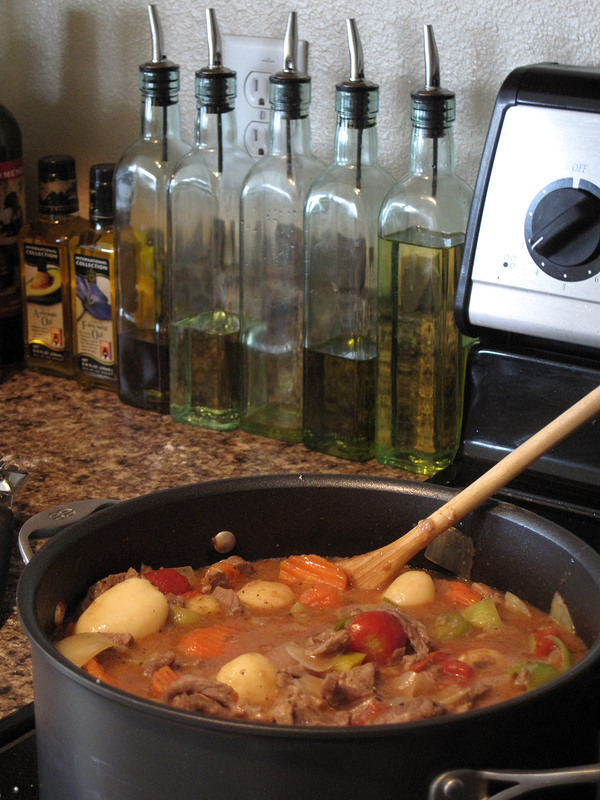 Stir the stew until the sauce becomes evenly smooth. Now add canned, drained potatoes. Don’t be tempted to use regular potatoes as they become too mushy. Cook over low heat for another 30 minutes or until vegetables are tender. NOTE: I do not currently have a Dutch oven, so I used a normal soup pot and it worked great – I let it simmer a bit longer to help the flavors further blend together. Loved this because I could just throw it on the stove for hours while I got things done (and worked from home). Reminiscent of my mom making soup in the morning and keeping it on low throughout the day for us to snack on whenever we were hungry. Bring above ingredients to a boil, then reduce heat and simmer for 3 hours. Remove meat and let cool. Simmer vegetables in soup, partially covered, for 1 1/2 hours. Separate meat from bone into bite size pieces. 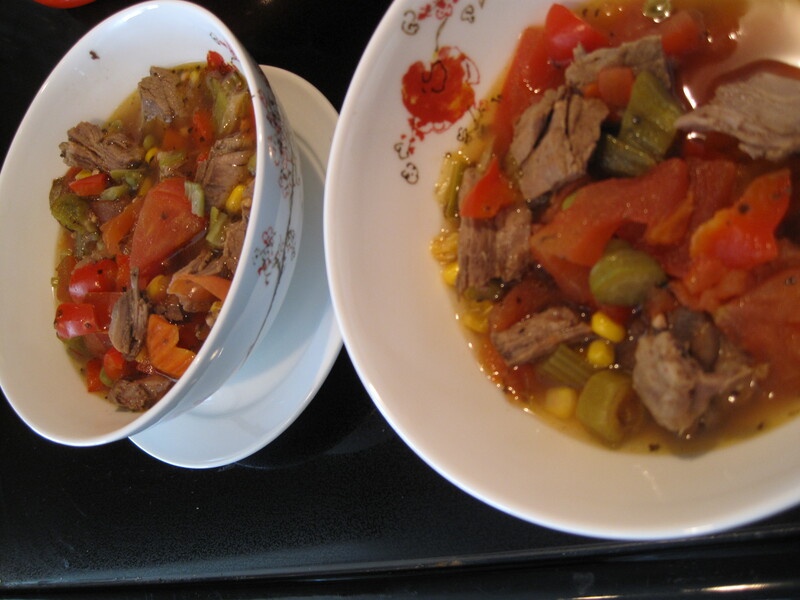 Toss meat into soup and simmer for another 5 minutes. I have a lot of trouble following recipes 1) Because I prefer to pave my own road and 2) the recipes just never taste that great because they lack flavor. I love flavor. This split pea recipe is from Tosca Reno’s “The Eat-Clean Diet Cookbook”. I loved her sweet potato oven fries and her oats & leek stuffed turkey breast. Both were PACKED with flavor, so I was not as leery when I decided to try her split pea soup. 1.5 hours later, I now have a chunky split pea soup. A comment or two: A dash of nutmeg might be a nice touch for a cold day to warm the cockles of your soul – or cayenne pepper to give it an extra zing. Additionally, I personally would reduce the water significantly. After all the veggies were cooked the recipe called for 2 cups of chicken broth (or preferred cooking liquid) AND 6 cups of water. I like a really chunky, creamy, thick soup. I think the recipe was not going for that, so all in all the soup came out as expected. Her salt suggestions are to taste, and it does need salt. My first split-pea soup. A-hhh success. 1 Put dried peas in large saucepann and cover with 12 cups/ 2.9 L of water. ADd 2 bay leaves and sea salt and bring to a boil. Let cook on meduim heat for 10 minutes. Drain and set aside. 2 In a Dutch oven, place olive oil and heat over medium heat. Add onion, celery and carrots. Saute for 8 minutes until onion begins to turn translucent. 3 Add chicken broth or preferred cooking liquid and 6 cups / 1.4 L water. Add 2 more bay leaves, peas, and thyme and bring to a boil. Add roasted turkey breast. Reduce heat and cover. Let simmer for an hour. The peas need to be soft. Check the pot now and then, since the peas have a tendency to settle to the bottom and burn. You’ll have to break them up by stirring them. 4. Remove the bay leaves and season with sea salt and fresh ground black pepper. Serve hot!